Alex Reyes has a 15.00 ERA over four games this season. ST. LOUIS – With the bullpen tired and pitcher Alex Reyes in need of more regular work to get on track, the St. Louis Cardinals announced four roster moves Sunday morning. The club optioned Reyes and infielder Yairo Muñoz to Triple-A Memphis and recalled two pitchers, right-hander Giovanny Gallegos and left-hander Tyler Webb, from the Redbirds. 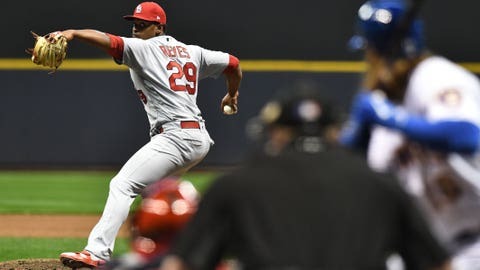 Reyes made four relief appearances for the Cardinals in the first week of the season, allowing runs in each of the last three after pitching a perfect frame in the season opener at Milwaukee. He has allowed five runs (all earned) over three innings. Reyes has missed most of the last two seasons rehabbing injuries. The Cardinals are trying to find the right balance of workload to help him find his groove. Muñoz has one hit in four at-bats in four games. The Cardinals acquired Gallegos, 27, in the trade that sent first baseman Luke Voit to the New York Yankees last July. He is 0-1 with a 4.55 ERA and 34 strikeouts in a combined 22 games covering 31 2/3 innings with the Cardinals and Yankees in 2017-18. The Cardinals picked up Webb, 28, on a waiver claim from San Diego. He then made 18 relief appearances with the Cardinals, going 0-0 with 1.76 ERA over 15 1/3 innings. He’s a combined 0-1 with a 4.76 ERA in 31 games (all in relief) in the majors, pitching for the Yankees, Brewers, Padres and Cardinals.